Birkerød, Denmark - JVL Industri Elektronik A/S, one of the world’s leading producers in the field of integrated servo and stepper motors, proudly announces a completely new generation of the NEMA23 integrated stepper motors that have proved their value for many years. The new motor family, ServoStep, uses the newest technology and the advancement of the previous designs, incorporating customers’ feedback. The family has the widest pallet of options in the market and will thus fit into all possible customer applications. First of all, integrated motors mean you get an all-in-one solution. In one unit you get motor, drive electronics, encoder, motion controller and an easily programmed embedded PLC with 8 I/O points onboard. The motors can operate as stand-alone units or be controlled from a master PLC or PC. The 8 I/O points can be individually configured as digital inputs, digital outputs or analog inputs. Even without options the new ServoStep motors offer some very strong features like closed-loop operation, torque control, ultra-high resolution of 409600 step/revolution resulting in unsurpassed smoothness and silent running plus a wide speed range from 0-3000 RPM with an extreme resolution of just 0.01 RPM. Power supply goes from 7 to 72 Volt DC and there are 4 pcs M12 industrial connectors for supply, signals and communications. Serial RS485 interface is standard on all motors. The family base line consists of high torque motors but if even more is needed JVL offers ultra high torque motors with up to 30% higher torque. There are ten different motors with 0.97 Nm to 3.1 Nm. 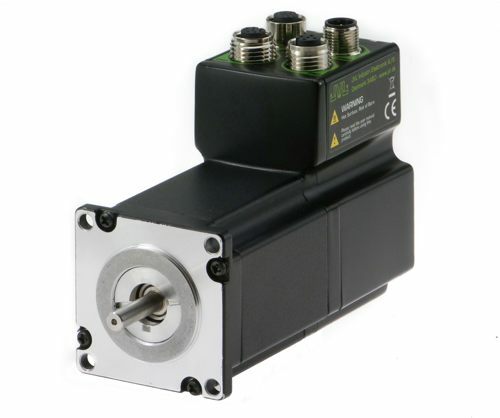 Popular options include: Absolute multiturn encoders, CANopen, double shaft, hollow shaft, electromechanical brakes (front or rear mounted), better IP protection class up to IP65, special customized connectors and Safe Torque Off (STO) input. 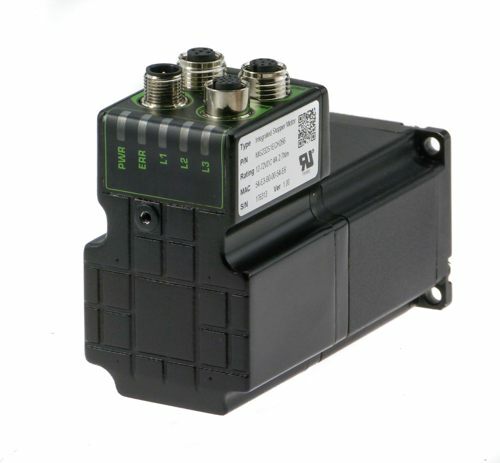 Even wireless options exist: Bluetooth, Zigbee and WLAN – ideal for AGVs and other battery supplied applications. All ServoStep motors can be delivered with industrial Ethernet onboard. You can choose among all major protocols: Profinet, EtherNet/IP, EtherCAT, Sercos III, Powerlink and ModbusTCP/UDP. No matter which Ethernet protocol were chosen for the machine or the whole factory the ServoStep motors can be connected. Cabeling is a hassle? Using the onboard Ethernet-switch you can daisy-chain cables from one motor to the next. Quite uniquely on the market, users can even change Ethernet protocol by updating the firmware using the MacTalk software. Read more about the motor here. About JVL - JVL is a world leader within the development and production of efficient and compact integrated servo motors and integrated stepper motors. MAC motor® are a series of integrated brushless servo motors (up to 4500 W and 13.5 kW peak) and QuickStep® are a series of integrated stepper motors (up to 25 Nm). Both the servo motor and stepper motor series include motor, controller, Nano-PLC, encoder and bus system integrated into one compact unit. All industrial Ethernet protocols like Profinet, EtherNet/IP, EtherCAT, Sercos III, ModbusTCP and Powerlink are available. JVL has more than 25 years of motion control experience and are well-known for their development and production of highly specialized integrated motors with industrial Ethernet and customized improvements. The close co-operation with customers and representatives result in cost-effective and technical optimized solutions for both basic and advanced motion control applications. JVL's wide selection of quality products for motion control applications include: Integrated brushless Servo motors, Integrated Stepper motors, AC Servo motor controllers, Motor drivers (DC, AC and Steppers), Brakes, Gear boxes and HMI touch panels.